A thumbs up on Facebook means you “Like” something. In the real world, a thumbs up signifies your approval. Apparently, a thumbs up to referee Herb Dean in the middle of a mixed martial arts scrap means you want him to stop the assault. Out of the 12 bouts that took place Saturday at UFC 169, 10 of them went to uneventful decisions. 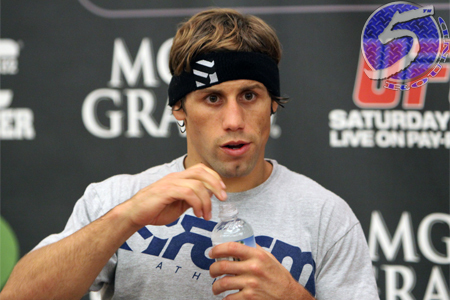 One of the show’s two finishes was in the main event between bantamweight champion Renan Barao and Urijah Faber (pictured). With nothing much to talk about from last night’s fights, Dean’s debatable premature stoppage is hoarding the MMA headlines this morning. Barao dropped Faber with an overhand right in the opening round and starting laying the lumber on the canvas. Although Barao was giving him the business, it appeared as though Faber was blocking most of the strikes. “The California Kid” even gave Dean the thumbs up to show he was not in danger and was weathering the storm. Apparently, Dean thought the thumbs up meant Faber was done so he stopped the attack. White has long professed Dean is “the best in the business,” but he wasn’t too impressed with his work last night. “You’ve heard me up here a million times talk about Herb Dean, I think he’s the best referee in the business,” White stated at the UFC 169 post-fight press conference. “He rarely ever makes mistakes, but he made a mistake [Saturday]. Despite losing his sixth straight title fight, Faber was once again all class in defeat. However, he did spotlight the fact Dean didn’t have as quick of a trigger when he reffed his first loss in September 2005. Faber’s professional record dropped to 30-7 courtesy of Barao (and arguably, Dean). Oddly, all of his losses have come in championship affairs.